Star Wars: The Old Republic isn't even out yet, but already the merchandising machine is kicking into high gear. And there's no gear higher than "life-sized replica statue" gear. 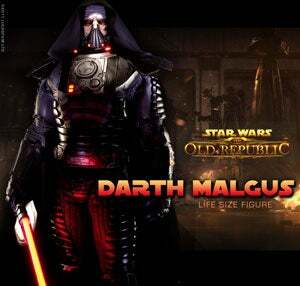 Sideshow will be releasing a 1:1 statue of the game's villain, Darth Malgus. That means he's life-sized. To get an idea of just how big (and slightly terrifying that is), here's what I assume was the prototype, or is at least something very similar, from this year's GamesCom. No word on cost yet, to either your wallet or your chances with the ladies, but it won't be cheap.